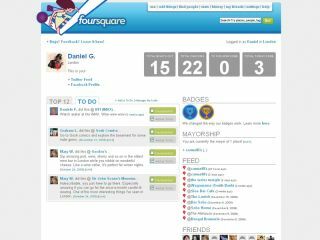 According to reports, Yahoo fancies buying Foursquare - and both Facebook and Microsoft have been sniffing around, too. We think Facebook should stop sniffing and stump up some cash before its rivals do. If Facebook isn't seriously considering a purchase - or developing a similar service, ahem, "inspired by" Foursquare - then its executives are completely nuts. They'd be nuts for two reasons: first, because real-world check-ins mean people would spend even more time using Facebook.com and the various Facebook mobile apps, and secondly because Foursquare has the potential to be the internet equivalent of the Tesco Clubcard. That could make a big difference to Facebook's income. The problem with Facebook is that while it gets Google-esque levels of traffic - in March its homepage had 7.07% of US internet visits compared to Google's 7.03% - it doesn't generate Google-esque amounts of money. The Wall Street Journal predicts that Facebook will bring in $710 million this year, but that's small potatoes compared to search: in the first quarter of this year, Google's revenues were $6.77 billion. Why are the numbers so different? One key reason is that when you Google, you're looking for something - so if Google sticks relevant adverts on your search results for smartphones, holidays, fridge freezers or anything else then it's going to generate a decent number of clicks from people who are interested in the advertiser's product. On Facebook, though, things are different. You don't go on Facebook to look for a new washing machine; you go on to play Farmville, or to stalk ex-partners, or to see what daft videos your friends have linked to. Ads on that kind of activity aren't very effective. That's where Foursquare could come in. By adding location-based "Here I am!" features to Facebook, the site could deliver advertising that's much more relevant than anything Google search can offer advertisers. A Google search tells advertisers what you're interested in, but a Foursquare update can tell advertisers where you are and what you're about to do. Clubs could tempt nearby punters out of bars and into their establishments. Restaurants could offer vouchers or specials. Airport-based businesses could tempt you from the other side of the terminal. Businesses could use Foursquare's badges as loyalty schemes, and historical location data could build up extraordinarily detailed pictures of people's interests. Not only that, but Foursquare can tell businesses whether their promotions work, and could be a mechanism for online ticketing. You can see why it would be good for Facebook, but it would also be good for us: with a simple, effective and lucrative way to make proper money from social networking, Facebook might even stop looking for new and exciting ways to mine our personal data and make its privacy features more confusing.